The Jalisco state government has released an informative 5-minute video highlighting some of the reasons why Jalisco is one of the best locations in Mexico for farming, business and tourism. The video can be viewed on Facebook: Esto es Jalisco. This is Jalisco. Following opening shots showing some of the diverse landscapes of the state, including the Piedrotas at Tapalpa, the majestic Volcán de Colima (whose summit is actually in Jalisco, not Colima) and the Horseshoe Falls near the Dr. Atl park on the northern edge of Guadalajara, the video’s subtitles (in English) turn to techno0logy and innovation. Jalisco is the first state in Mexico to have a Ministry of Innovation, Science and Technology. The state capitol Guadalajara is the center for MIND (Mexican Innovation and Design Center) and was chosen by MIT for the establishment of a Creative Digital City. 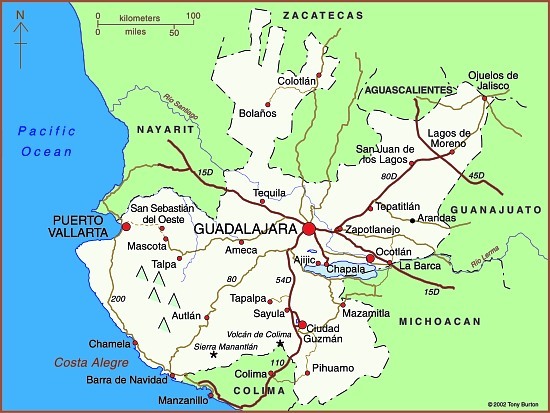 Map of Jalisco. Copyright 2010 Tony Burton. All rights reserved. The city also has major cultural and sporting attractions, from libraries to golf courses to hosting international events in the Expo Guadalajara to concerts and its own international film festival. It also hosts the world’s second largest book fair (after Hamburg). Its industrial activity ranges from agro-processing (including tequila) to pharmaceuticals, information technology, automotive and aerospace firms to renewable energy enterprises. Foreign investment in Jalisco has risen by an average of 17% a year for the past decade, with foreign firms finding the state’s geographic position advantageous for serving central Mexico and with excellent trade links to Asia and the U.S. The state’s leading coastal resort is Puerto Vallarta, but tourism is also important in the state’s interior. Jalisco has five places with Magic Town status: Lagos de Moreno, San Sebastian del Oeste, Tapalpa, Mazamitla and Tequila. Jalisco currently accounts for 6.6% of national GDP and the state government clearly expects this contribution to grow in coming years. This professionally-produced video is an excellent visual introduction to one of Mexico’s most important states. Is Jalisco the most “Mexican” state? Informative, snappy Jalisco video. Highlighting Guadalajara as an innovative tec. and industrial centre is a welcome change from the usual mariachi /tequila portrayal of Jalisco from government sources.